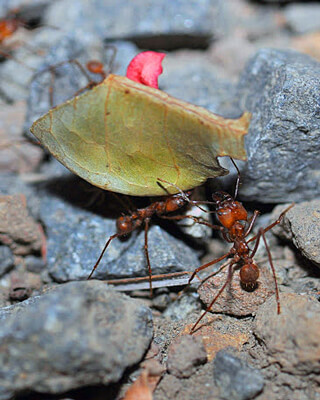 On a typical walk through a Neotropical rainforest, chances are high that you will have the privilege to observe spellbinding leaf-cutter ants. The forests of Monteverde Cloud Forest are full of these fascinating creatures. Their meandering, worn foraging paths, populated by lines of workers carrying vibrant plant bits, are an unforgettable sight. These insects are tiny in stature, yet huge in terms of their distinctive natural history and ecological importance. Leaf-cutters are one of just a handful of animals that are nature’s farmers, and they are even more unique in being able to cut fresh vegetation for use as a fertile base on which to grow the fungus that they tend and eat. Moreover, their complex social interactions are more fascinating than what you can find on even the zaniest reality show. Read on to learn how such small animals can tackle such a huge job.